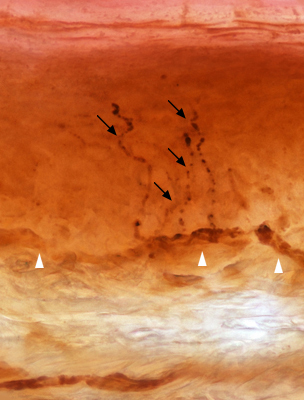 Similar to the clinical peripheral neuropathy in man, the degeneration of intra-epidermal nerve fibers (IENF) can be monitored and quantified in various animal models of peripheral neuropathy. NEUROFIT implements this translational test to evaluate the neuroprotective effect of drug therapy as a treatment for peripheral neuropathy but also to study the peripheral neuropathy as a result of a potential side-effect of a drug treatment. Neuroprotective drugs are usually tested in this model but other treatments could also be considered. Please feel free to contact us to discuss the feasibility of your study. Many drugs and toxins have been reported to induce peripheral neuropathies. Often, this adverse effect requires the withdrawal of the treatment. 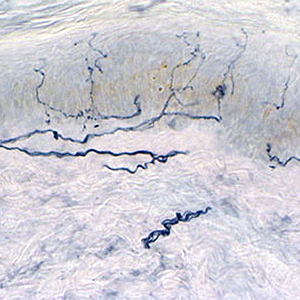 Degeneration of intraepidermal nerve fibers (IENF) is also found in neuropathies associated with metabolic (diabetes), infectious (HIV/AIDS) and autoimmune (vasculitis) diseases. Degeneration of IENF is a sensitive clinical marker to evaluate the severity of peripheral neuropathies. Loss of IENF is observed in both symptomatic or asymptomatic peripheral neuropathies. Compound muscle action potential (CMAP) consist in stimulating a nerve fiber and monitoring the response in the muscle. The Hot Plate test consists in a thermal pain measurement. The paw pressure test consists in applying a uniformly increasing mechanical pressure on the animal paw. Sensory nerve conduction velocity is used in the diagnosis of nerve damage or nerve dysfunction. 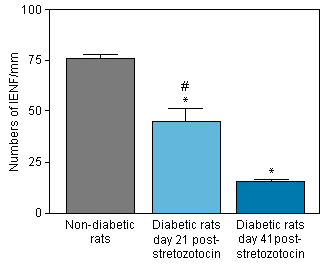 Diabetic neuropathy can be studied in rat following streptozotocin administration which induces a rapid and persistent hyperglycaemia. 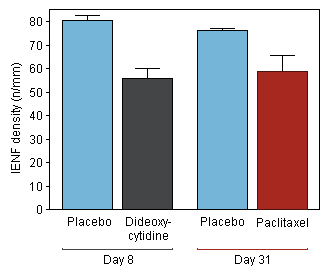 Painful diabetic neuropathy can be studied in rat within few weeks following streptozotocin administration.